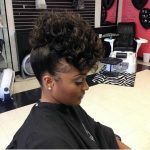 The French twist hairstyle is one beautiful updo known to impart an amazing grace and sophisticated charm to the women. It is considered to be stylish and formal which suits women of all age groups. If you are looking for an elegant updo for some casual occasion, the french twist you should not never miss. Here is a great French twist updo from Courteney Cox you may love. The blue-eyed beauty Courteney Cox wore an elegant loose twisted black French twist with face-framing bangs and a stunning pair of drop gemstone earrings. The French twist hairstyle is not that difficult to make as it seems to be. With little patience and skill, you can create the perfect look. I love this style so much, how about you? This is a perfect updo for wedding, homecoming and prom! Under: Hairstyles Black Prom Hairstyle Ideas: Mysterious & Beautiful!